The good news was so good that the U.S. Department of Energy (DOE) couldn’t wait to tell the world. “Federal hydrofracking study shows no contamination of drinking water in Pennsylvania!” the Associated Press dutifully headlined the DOE study that proved nothing of the kind. What the article actually documented was that, from a sample of one out of tens of thousands of fracked Pennsylvania wells, “preliminary: results from an “ongoing study” found no fracking chemical markers in the drinking water above. It should be noted that Dr. Jackson was part of a peer-review Duke University study that found “evidence that natural gas escaped from some wells near the surface and polluted drinking water in northeastern Pennsylvania.” Jackson’s suggestion that DOE may have cherry-picked its sole-studied well, or that the unnamed gas company may have led DOE to a pre-selected sample is cautionary indeed. If this seems unjustly conspiratorial, consider that the DOE study was conducted by the National Energy Technological Laboratory (NETL). So who are they? So, I guess “Federal hydrofracking study shows no contamination of drinking water in Pennsylvania” isn’t a firm scientific claim then, but just a corporate happy thought. Well, thanks, DOE, for the terrific sneaky preview. And, for what it’s worth, in my preliminary opinion you’re doing a crackerjack job of fulfilling your mission—to enable the gas industry, despite the facts or good scientific method. Thanks Steve, for uncovering and writing about this and offering it to our website. Here's a billboard we'd like to see. In a quarterly campaign statement filed on July 23 the Michigan Chamber of Commerce’s ballot question committee reported direct contributions of $324,525 in the April-July period. 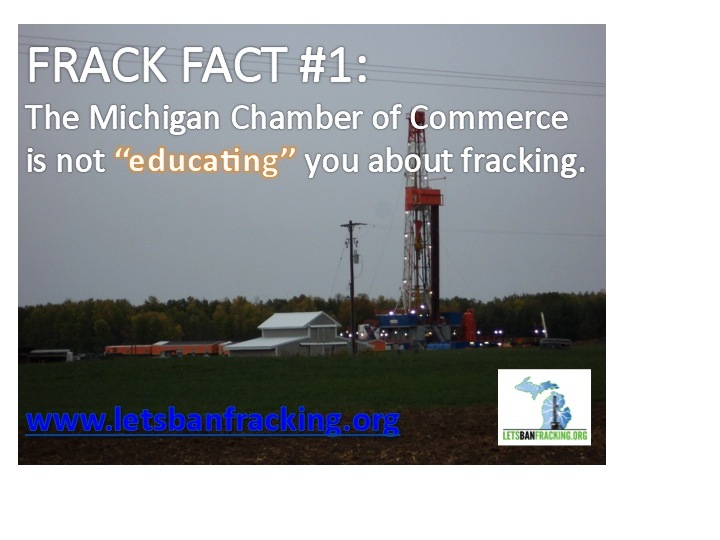 The money is to be spent on billboards and a website to try to defeat the ballot initiative of the Committee to Ban Fracking in Michigan, according to the Chamber’s new campaign website http://www.michamber.com/energyindependence . Named “PAC II,” the Chamber’s ballot question committee reported $37,500 of the total was from out of state. Earlier reports show PAC II had been nearly moribund until the Committee to Ban Fracking’s campaign began in April. PAC II also had in-kind contributions, most related to a golf outing and office work, and most paid by the Chamber and several resorts and hotels. The total: $9,131.94. Notably, Michigan’s big fracker Encana Oil & Gas (USA) and its Grand Rapids law firm Mika Meyers contributed ($5,000 and $500, respectively). Encana is a subsidiary of a Calgary-based firm of the same name with assets of US$14 billion. Last year it fracked a well in Kalkaska County with 21 million gallons of water, a world record. At least ten other energy companies donated more than $10,000 each and at least twelve others over $5,000. Most of the rest went for expenses at a golf outing on June 10 at Hawk Hollow, a luxury resort near Lansing. The event netted $34,622.68 on attendance of 69, or just over $500 each. Last year PAC II spent $3.6 million opposing renewable energy and union ballot initiatives to amend the Michigan constitution. The Chamber itself made more contributions against the initiatives on top of that. PAC II’s financial reports are here: http://miboecfr.nictusa.com/cgi-bin/cfr/com_det.cgi?com_id=513425 . Contributors to PAC II and the dollar levels in April-July are listed at the end of this article. They are hardly the grass roots. A Detroit Free Press story on financial reports for ballot drives missed out on the Michigan Chamber’s PAC II. http://www.freep.com/apps/pbcs.dll/article?AID=2013307250178 . WHAT DOES PAC II REALLY STAND FOR? PAC II’s founding statement in 2007 did not name the ballot proposals it supported or opposed. It should have, in item # 12 on the form. In addition to the Committee to Ban Fracking, today there are three other Michigan ballot proposals in the qualifying stages. One is about abortion, one is about wolves, and one is about ballot referendums. None of them spent nearly as much as PAC II in the April-July period. On August 6 we asked an analyst at the state campaign finance bureau how the public could tell from PAC II’s report which ones of the four proposals the Resource Group’s $20,000 work would address. We are guessing that probably 100% of the Group’s efforts will be directed at the frack ban initiative, but the financial report doesn’t actually say that. As it stands, PAC II would be free to allocate substantial money to support or oppose, for example, the abortion proposal. Is this proper? Puzzled at first by the question, the state analyst finally said a letter would go out to PAC II demanding which ballot questions the Group would address, and whether it was for or against. PAC II must answer in 9 days. * Energy independence and out-of state interests: Michigan’s biggest fracker is foreign-owned and much of the gas produced would go out of the state and country. Only 25% of the gas found here is produced by Michigan-based companies. The Chamber can hardly complain of out-of-state interests when it is taking $37,500 from them. * Tough regulation: DEQ plays patsy for the industry, as demonstrated most recently by its bungling close-mouthed slap-on-the-hand response to a distributor who put 300,000 gallons of poisonous oilfield wastes (that they would like to call “brine”) on roads near the Platte River in rural Benzie County in June. * Petition drives of last year: All of them sought constitutional amendments. The frack ban initiative this year seeks a legislative amendment. The Michigan Chamber puts all initiatives into one category, and their message to voters is that democracy is just not convenient for Big Business (especially polluting industries). They’d rather keep decisions about fracking in the hands of their lobbied and industry-supported legislators–not the voters of Michigan. * Safe fracking in 12,000 wells: This is not true. Most of the 12,000 involved vertical fracking, and the track record for Michigan DEQ is not stellar. See Dr. Christopher Grobbel’s talk on this point here. The ballot initiative would ban only horizontal fracking. * Direct attack on a key industry: First, an industry which poses a silicosis hazard to its workers and contamination danger to its neighbors, and destroys the livelihoods of others can hardly be called “key.” But the rest of this point does hold water and it’s a good one. The ballot initiative attacks the oil-gas industry’s special-interest protection which it has enjoyed for years. Michigan has a law saying the DEQ has to construe everything in a way to “foster” the industry favorably, and “maximize” oil-gas production. In other words, maximize the state’s contribution to global warming, and maximize oil-gas profits. That’s why the industry today has so much money. The initiative would change the DEQ’s duty so it would have to protect human health and water. Isn’t that what a Department of Environmental Quality is supposed to do? Protect the quality of the environment rather than the health of the pocketbooks of oil and gas? Financial reports of the Committee to Ban Fracking in Michigan are here: http://miboecfr.nictusa.com/cgi-bin/cfr/com_det.cgi?com_id=515957 . In the same April-July period, they show direct contributions of $12,482.01 and in-kind contributions of $70.12. Expenditures were $5,734.64, primarily for printing. The Committee to Ban owes $3,935. In other words the industry has collected 26 times what the Committee to Ban has collected. Does the Committee stand a chance against such odds? Yes. First, we expected the industry to bully and pile on, but we didn’t imagine it would do so while the Committee was still qualifying for the ballot. The Chamber’s bag of dirty fossil fuel money means it figured out in April the Committee to Ban will make it. The Chamber is nervous and uncertain. Well it should be, with so much to lose. Second, these are bullying tactics, intended to intimidate. We think the voters will see that. In Longmont Colorado last November the industry outspent ban supporters by a similar margin — $500,000 to $25,000. The result: 60% of voters went for a ban. Third, a video on the PAC II website says if the Committee makes the ballot, voters will be “barraged by 30-second sound bites.” Interesting. Radio and TV sound bites are expensive. The Chamber not only expects the Committee will make the ballot, but when it does the grass roots will step up with money. The giant is angry and confused. With discipline and dedication we can tip him over. (Sign up here to volunteer or contribute to Committee to Ban Fracking in Michigan). $50,000: Michigan Chamber of Commerce. $10,000: Muskegon Development Co, Breitburn Energy Partners, Jordan Exploration Co, Summit Petroleum Corp, Savoy Exploration, Dart Oil & Gas, Merit Energy, Countrymark (Indianapolis IN), DTE Energy, Michigan Oil and Gas Association, West Bay Exploration Co, Jackson National Life Insurance, Linn Energy (Houston TX), Strickler Resources. $5,000: Trendwell Energy, MITEP, Omimex Energy (Fort Worth TX), Paxton Resources, OIL Energy, Enervest Operating East (Charleston WV), Miller Energy, Core Energy, Bigard & Huggard Drilling, Wavelet Investments, Amway, Fruehauf Production Co, Rock Oil Co, Southwestern Oil Co, Encana Oil & Gas USA (Denver CO), Western Land Services, Kelly Miller Miller Investment Co.
$2,500: Harkins Energy, Kler Energy, McLaren Health Care Corp, Consumers Energy, Gulfmark Energy, Pharma (Indianapolis IN), Citizens Insurance, Nestle Waters North America. $1,300: Republic Services, Alerus Financial Corp, Packaging Corp of America, Physicians Health Plan Inc.
$1,000: Worman & Dixon PLC, Marketing Resource Group, General Agency Co, MI Cable Telecommunications Assoc, Great Lakes Caring, Truscott Rossman Group, Allied Printing Co, Lilly USA, Indian Trails. $ 600: Anderson Economic Group, Frankenmuth Mutual Insurance. $ 500: North Bay Energy, SHA Energy, Greg Fogle Old Mission Energy, Mika Meyers Beckett & Jones. $ 300: MI Infrastructure & Trans Assoc, Edward C Levy Co, Wolfgast Corp, New Center Stamping, Governmental Consultant Svcs, Lockwood Companies, AAA Automobile Club of MI, Bull Enterprises, Auto Owners Insurance Co, Meijer. $ 275: Quality Pool Supply Co.
$ 200: William Stelzer Stelzer Consulting, David Moody.